At a special event today Microsoft took the wraps off a lot of new hardware - specifically, the Surface Pro 6 and Surface Laptop 2, both with a matte black color option, but also the Studio 2 and the all-new Surface Headphones. Let's dive right in. The Surface Pro 6 sports Intel's latest 8th-generation processors, and it also boasts improved internal cooling. That means you can get it with quad-core processors, and Microsoft says it will be 67% faster than its predecessor. You can expect 13.5 hours of battery life. The device weighs 1.7 pounds and has the same 12.3-inch display and up to 16GB of RAM and a 1TB SSD. Unfortunately it has the same external design as the previous generation Surface Pro, which means no USB-C ports. 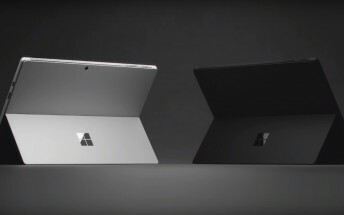 The Surface Pro 6 will start at $899 with a Core i5, and it will be released on October 16, with pre-orders set to debut today. The Surface Laptop 2 is going to be a whopping 85% faster than the original, once again thanks to Intel's 8th-gen CPUs. It also has the thinnest ever LCD on a laptop. The hardware looks identical to the first Surface Laptop, so you don't get even one USB-C port here either. The screen is still 13.5", but now has 1500:1 contrast ratio, and Microsoft is quoting 14.5 hours of battery life. Typing on the Surface Laptop 2 should be quieter than on its predecessor. The new model will be out on October 16, starting at $999. Pre-orders start later today. The Surface Studio 2 looks pretty much identical to its predecessor (as that seems to be the theme of this event), but is the fastest Surface ever. It packs a 38% brighter screen (over 500 nits brighter than before) and 22% has more contrast. The display supports the DCI-P3 color space. The Studio 2 comes with Nvidia's next-gen Pascal graphics (not an RTX GPU) and a 2TB SSD. No more hybrid disk drive. The starting price will be a hefty $3,499. Pre-orders should be available today. The Surface Headphones are a new addition to Microsoft's hardware lineup. They are Bluetooth cans with adjustable noise cancellation (13 levels) and Cortana built-in. They have 40mm drivers, 4 beam forming mics, and 4 active noise cancelling mics. They will cost $350 when they go on sale later this year.